Azzi, Stephen. "Michaëlle Jean". The Canadian Encyclopedia, 22 January 2019, Historica Canada. https://www.thecanadianencyclopedia.ca/en/article/michaelle-jean. Accessed 23 April 2019. Michaëlle Jean, social activist, journalist, documentary filmmaker, governor general of Canada 2005–10, secretary general of the Organisation internationale de la Francophonie 2014–18 (born 6 September 1957 in Port-au-Prince, Haiti). The Right Honourable Michaëlle Jean, Governor General of Canada from 2005 to 2010 (photo by Sergeant Éric Jolin, courtesy Rideau Hall). Coloured pencil on wove paper, 51 x 66 cm Image: National Gallery of Canada, Ottawa/Photo © NGC/© Dorset Fine Arts. Michaëlle Jean's early years were spent in a middle-class neighbourhood in the Haitian capital, Port-au-Prince, where her father was principal and teacher of philosophy at an elite, Protestant preparatory school. She was educated at home because her parents, Roger and Luce, did not want her to attend school, where she would have to swear allegiance to dictator François "Papa Doc" Duvalier. In 1965, her father was arrested and tortured. In 1967, he fled to Canada; his wife and two daughters joined him the next year. The family settled in Thetford Mines, a Québec mining town, where Roger taught at the local college. Jean later recalled that her father was, by this point, a "broken man," increasingly prone to violence. Her parents' marriage disintegrated, and Jean moved to Montreal with her mother and sister. 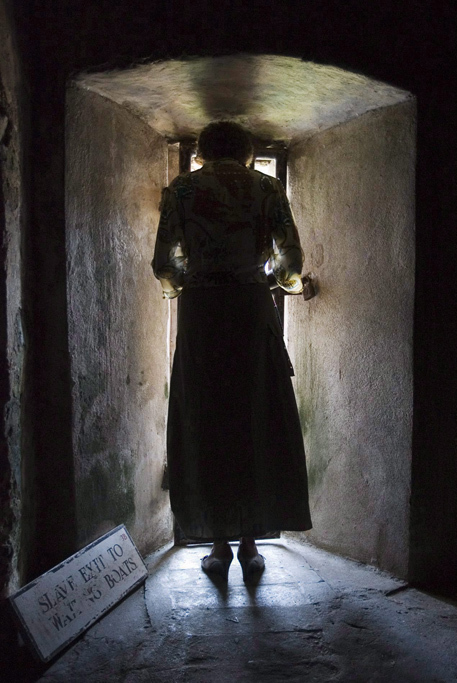 They lived in a basement apartment, while their mother supported the family by working first in a clothing factory and then as a night orderly in a psychiatric hospital. Jean attended the Université de Montréal, where she received a bachelor's degree in Italian and Spanish. She began a master's degree in comparative literature at the Université de Montréal, taught Italian at that institution, and won scholarships that allowed her to make several trips to Italy to study at universities in Perugia, Florence and Milan. She became fluent in five languages (French, Haitian Creole, English, Italian, and Spanish). She was also an activist on the issue of domestic violence, working with shelters for battered women and coordinating a government-funded study on spousal abuse during her time in university. In 1986, Michaëlle Jean returned to Haiti with a friend to conduct research for an article on the island's women. The two arrived to witness the ouster of Jean-Claude "Baby Doc" Duvalier, the country's dictator and son of the man whose regime Jean's family had fled. Jean's work caught the eye of a National Film Board producer, who invited her to return to Haiti as a researcher and interviewer for a film on the 1987 Haitian elections, shown on Le Point, a news magazine program on Radio-Canada, the French language arm of the Canadian Broadcasting Corporation. When Radio-Canada subsequently hired Jean, she became the first Black person on French television news in Canada. She worked as a reporter or host for several of the network's programs, including Actuel, Montréal ce soir, and Virages. In the mid-1990s, she moved to RDI, Radio-Canada's all-news network, becoming host of le Journal RDI and other programs, winning many awards along the way, including a Gemini. By 2004, she was well enough known among Francophone Canadians to launch her own current affairs show on RDI, entitled Michaëlle. In English Canada, she was familiar to viewers of CBC Newsworld's documentary programs The Passionate Eye and Rough Cuts, both of which she had hosted since 1999. With filmmaker husband Jean-Daniel Lafond, Jean made several documentaries in the 1990s, including Tropique Nord (Tropic North), about the Black experience in Québec; the award-winning Haiti dans tous nos rêves (Haiti in All Our Dreams); and L'heure de Cuba, on the 40th anniversary of the Cuban revolution. 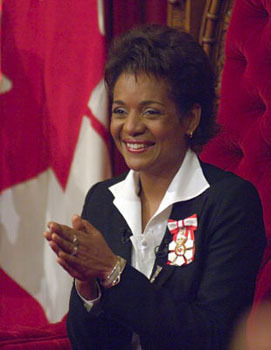 In August 2005, Prime Minister Paul Martin announced Michaëlle Jean's appointment as governor general, news that sparked controversy. A Québec sovereigntist publication suggested that Jean and her husband had supported the separatist cause in that province. At first, Jean refused to respond, but then issued a brief statement insisting that she had never belonged to the separatist movement. Debate over her dual citizenship (she became a French citizen when she married Lafond, who was born in France) subsided after she renounced her French citizenship shortly before taking office. Jean was sworn in as governor general on 27 September 2005, succeeding Adrienne Clarkson. Jean became the first Black	person to serve as governor general. The descendant of enslaved people, she used her office to passionately emphasize freedom as a central part of the Canadian identity. Reflecting on her experience as an immigrant, Jean argued that it was time to "eliminate the spectre" of the two solitudes, French and English, which had long characterized the country's history. As governor general, Jean showed herself to be a passionate speaker and a photogenic presence. 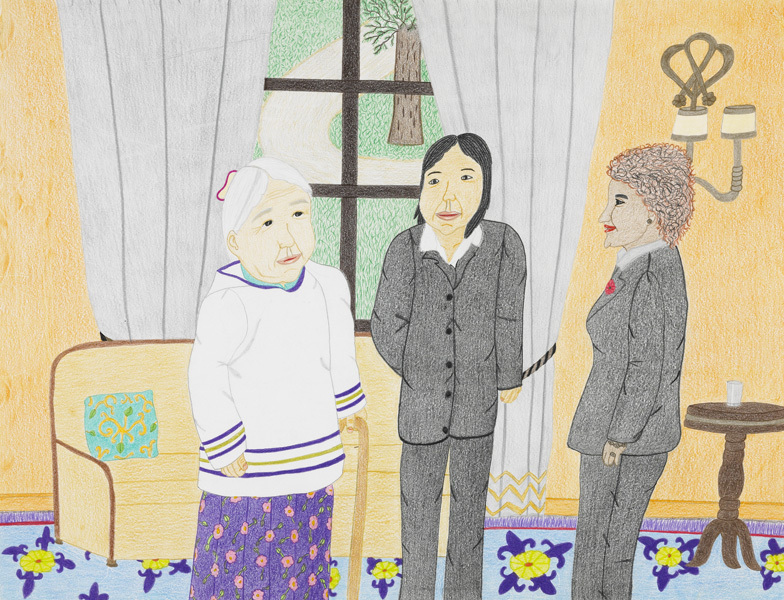 She used her office to advance human rights, support the arts, draw attention to socio-economic problems in the Canadian North, and promote Canada abroad, particularly in Africa and her native Haiti. Image: The Canadian /photographer Fred Chartrand. In December 2008, Jean agreed to Prime Minister Stephen Harper's request to prorogue Parliament	for seven weeks. Her controversial decision allowed Harper to escape defeat in the Commons, where the opposition parties had agreed to replace his government with a Liberal- NDP coalition led by Stéphane Dion. In keeping with Canadian parliamentary tradition, the governor general did not explain her reasons publicly. On 1 October 2010, Jean was replaced as governor general by David Johnston. In 2010, Michaëlle Jean became UNESCO's special envoy to Haiti. She also created the Michaëlle Jean Foundation to help underprivileged youth in rural and northern Canada. Jean was named chairperson of the board of directors for the Institut Québécois des hautes études internationales (Québec Institute for International Studies) at Université Laval in October 2010. She became the chancellor of the University of Ottawa in February 2012, but resigned in 2015 due to the frequent travel and extensive responsibilities associated with her position as secretary general of La Francophonie. Michaëlle Jean was appointed secretary general of the Organisation internationale de la Francophonie (International Organisation of La Francophonie) on 30 November 2014, during the 15th summit of French-speaking nations in Dakar, Senegal. She is the first woman and the first Canadian to hold the position. Jean was replaced by Rwandan Foreign Minister Louise Mushikiwabo in October 2018. Michaëlle Jean elected new head of la FrancophonieAn article story about the selection of former Governor-General Michaëlle Jean to be head of la Francophonie, an organization of French-speaking states. From The Globe and Mail. La FrancophonieInformation about Canadian participation in the International Organization of La Francophonie. From the Government of Canada website. Michaëlle Jean chosen as new head of la FrancophonieA CBC News story about former Canadian governor general Michaëlle Jean's appointment to the position of Secretary-General of la Francophonie.